What better way to see the Christmas Markets between Passau and Vienna than with a Cruise along the Danube! Our ship is the A-ROSA - Imagine drifting by, with all the beauty of the river right before your very eyes while on-board one of the modern A-ROSA cruise boats. Never has travelling been better or more relaxed, never has being on a ship been more modern. Lots of comfort in the cabins with plenty of room for your luggage. The Danube fleet offers you comfort of the highest standards. You will enjoy your vacation in an exclusive world of the best boats of their class. If sports are your thing, try out the Fitness room. If you need to relax, check out the panoramic view and the wellness program. There is a day-lounge with a bar, a library and an amazing restaurant. What more could one want? All cabins are comfortably furnished in an elegant way. Moreover, they possess individually regulated air-conditioning. 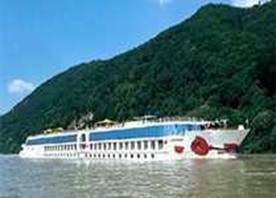 The A-ROSA Danube Ships offer each 100 outer cabins in 4 categories, e.g. with a French balcony or a panorama window. Inquire about our special land tour extension! Take advantage of South African Airways flights that now stop in Dakar, Senegal enroute to South Africa and enjoy this combination tour of West and South Africa. FRIDAY: Arrive Dakar early morning. Meet and transfer to your hotel for a rest before the afternoon city sightseeing tour. SATURDAY: Full day excursion to Goree Island. Visit the Slave House, Historic Museum, Old Colonial Church, Castles and the beautiful small market. Lunch is included. SUNDAY: Very early transfer back to the airport for the continuation of your flight to Johannesburg, South Africa. Arrive later today, meet and transfer to your hotel for overnight. The LAND ONLY cost for this tour is $3,620.00 per person, double. Airfare to/from the U.S.A. and from Durban to Port Elizabeth is not included. We will be happy to quote current fares. Other tours within South Africa are available. Please see our page on South Africa. As always, we are happy to custom design an itinerary for you. rates per person in double or triple accommodation. alcoholic drinks, mini-bar and boutique consumptions. NEW FOR 2006 - SCENIC POLAND. SEE DETAILS OF THIS TOUR IN THE EUROPE SECTION. SCHEDULED MOTORCOACH TOUR WITH GUARANTEED DEPARTURES. A GREAT WAY TO SEE POLAND!!! Check our site for some great itineraries to these and many more destinations. Remember, we can also customize your itinerary to suit your particular needs. NEW NEW NEW NEW NEW NEW !!! We've just returned from a cruise to Scandinavia, Russia and the Baltic state of Estonia. We have some great tips and money saving ideas for cruisers. Book your cruise with us and get the "inside track"